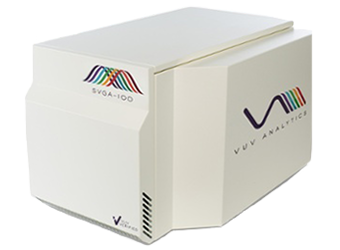 The SVGA Streaming Gas Analyzer allows for continuous monitoring and real-time measurement of gas purity and concentrations in the 120nm – 240nm VUV wavelength range. The absorption cross-section of gas phase molecules in the VUV spectrum are hundreds of times stronger than in the infrared (IR) region, resulting in a new standard of sensitivity in continuous gas analysis. The SVGA is ideally suited for real-time gas compound analysis where relatively equivalent concentrations are being used or analytes absorb in different regions of the VUV spectrum. 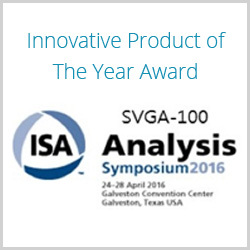 Recognized as the “Innovative Product of the Year” at the ISA Analysis Division Symposium, the SVGA brings detection perfection to the laboratory benchtop. Explore the benefits of the world’s first Vacuum Ultraviolet (VUV) streaming gas analyzer.